Street vendors are ubiquitous across the world and throughout history. They are part of almost any distribution chain, and play an important role in the marketing of consumer goods particularly to poorer customers. Focusing on the food trades, this multi-disciplinary volume explores the dynamics of street selling and its impact on society. Through an investigation of food hawking, the volume both showcases the latest results from a subject that has seen the emergence of a significant body of innovative and adventurous scholarship, and advances the understanding of street vending and its impact on society by stimulating interdisciplinary and cross-disciplinary discussions. 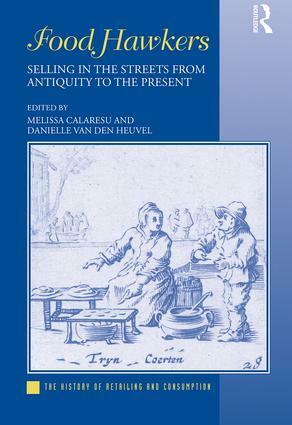 Covering a time span of approximately two millennia, from antiquity to the present, the book includes chapters on Europe and Asia, and covers a diverse range of themes such as the identity of food sellers (in terms of gender, ethnicity, and social status); the role of the street seller in the distribution of food; the marketing of food; food traders and the establishment; the representation of food hawkers; and street traders and economic development. By taking a dynamic approach, the collection has enabled its contributors to cross disciplinary boundaries and engage in discussions which extend beyond the limits of their own academic fields, and thus provide a fresh appreciation of this ancient phenomenon. Contents: Introduction: food hawkers from representation to reality, Melissa Calaresu and Danielle van den Heuvel; Representations of food hawkers in ancient Rome, Claire Holleran; Quodlibets and fricassées: food in musical settings of street cries in early modern England, Deborah L. Krohn; Street cries on the frozen Thames: food hawkers at London frost fairs, 1608-1814, Ivan Day; Food, markets, and people: selling perishables in urban markets in pre-industrial Holland and England, Danielle van den Heuvel; Food selling and urban space in early modern Naples, Melissa Calaresu; The myth of la Belle Madeleine: street culture and celebrity in 19th-century Paris, Tom Stammers; The street food sector in Vietnam: serious business for women entrepreneurs, Annemarie M.F. Hiemstra; Street-food hospitality in contemporary Calcutta, Manpreet Janeja; Negotiating gendered spatial boundaries: women’s food-hawking in Penang, Malaysia, Anja Franck; Select bibliography; Index. Melissa Calaresu is a Fellow and Lecturer in History at Gonville and Caius College, Cambridge, and has written on the Grand Tour, historical and autobiographical writing, urban space, reform to revolution, and most recently, the making and eating of ice cream in eighteenth-century Naples. She is co-editor of Exploring Cultural History: Essays in Honour of Peter Burke (2010), New Approaches to Naples c.1500-c.1800: The Power of Place (2013), and the catalogue for the Fitzwilliam Museum exhibition, Treasured Possessions from the Renaissance to Enlightenment (2015). Danielle van den Heuvel is Senior Lecturer in early modern European History at the University of Kent. Her publications include the award-winning Women and Entrepreneurship. Female traders in the Northern Netherlands, 1580-1815 (2007), and cover retailing, food markets, and informality in the context of the Dutch Republic and beyond. Initially published by Ashgate, Routledge welcomed the History of Retailing and Consumption book series to the fold in 2016. The series aims to explore all aspects of the broad field and to date, themes have included retailing, fashion, design and food with studies spanning the whole gamut of historical eras from ancient times to the twentieth century.